A few weeks ago I dug into the USL Pro goings on and found a one; Matthew Delicate. Or Deli, as I hear teammates and fans call him. It was determined by my computer machine that he was the best player in the USL Pro division. Karma has spoken here at HölleStadt Bier. Mr. Delicate and his team, The Richmond Kickers, are going to be taking on the Columbus Crew at Crew Stadium on Tuesday, June 28th in the third round of the 2011 Lemar Hunt US Open Cup. Our countries oldest soccer event (by far). Incedientally, Lemar Hunt helped restart this soccer in North America thing back in the '90s. His family set up the Crew and built the first soccer specific pro stadium in the MLS. The Crew have his initials on the back of their jerseys. You may even see this LH logo on the pitch from time to time. Who are the Richmond Kickers (besides being from the great Commonwealth of Virginia)? Here are the players with their player ratings on the left. Again, this is in relationship to the rest of the league. Mr. Delicate is the best player. Another name to take note here is David Bulow. He has 5 goals in 2 games during this years Open Cup. The Crew has a very, very busy schedule coming up next month. Busiest of the year actually. They will probably go with a lot of reserves for this match up. 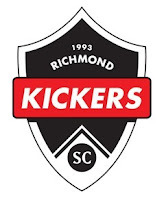 The Richmond Kickers will be bringing everything. Including their league's best player and LH Open Cup goal leader Bulow. Should be good. Any Crew fan with their head screwed on straight should check it out. Kickers logo at top was designed by Thinkhaus of Richmond. Very clean, very good.